Comfort a) Creates a comfort-based vehicle setup and is suited to poor-quality sections of road or long motorway journeys. Normal Balanced setting, e.g. for everyday use. Sport Gives the vehicle a sporty driving feel and is suited to a sporty driving style. Eco Switches the vehicle into economical mode and helps the driver to drive the vehicle in a fuel-efficient manner. Individual Individual systems can be adjusted to suit your personal requirements . The effect on the vehicle settings in the individual driving modes depends on the vehicle equipment level. The driving mode can be changed while the vehicle is stationary or when in motion. After selecting a driving mode, the vehicle settings (excluding engine settings) are switched to the new driving mode immediately. When traffic conditions allow, briefly take your foot off the accelerator to activate the newly selected driving mode for the engine. While the vehicle is in motion, the DCC constantly adjusts the suspension characteristics to match the road surface and the current driving situation, in accordance with the preset vehicle settings. If there is a fault in the DCC, the symbol appears in the instrument cluster display along with the message Fault: damper control. 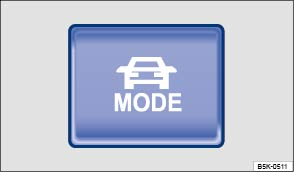 In Sport mode, power steering is reduced and the effort required to steer the vehicle increases. The vehicle's driving response becomes more agile. The engine and gearbox will give either a more dynamic or more balanced response to the movement of the accelerator, depending on the selected driving mode. In vehicles with an automatic gearbox, the gear shift points and the coasting mode will also change. An active cruise control system (CCS) can affect the acceleration response. When the ACC is active, acceleration and deceleration of the vehicle becomes more ecological or sporty. The dynamic bend lighting and the automatic main beam assist will give either a more dynamic or more balanced response to the current driving situation, depending on the selected driving mode. In Eco mode, the air conditioning will be set to run even more economically. Ensure that the ignition is switched on. Press the Driving Mode Selection button . The Driving Mode Selection menu appears in the infotainment system display. The active driving mode is selected. Touch the Information function button to display additional information about the current driving mode. Press the Driving Mode Selection button and touch the function button for the selected driving mode in the infotainment system display. The selected driving mode will remain set even after the ignition has been switched off. The last activated driving mode will be assigned to the vehicle key that has been used. Changing the driving mode can alter the vehicle handling. Never allow Driving Mode Selection to tempt you into taking any risks when driving. The Eco mode is blocked when the vehicle is towing a trailer. If the vehicle is in Eco mode when a trailer is hitched and electrically connected to the towing vehicle via the trailer socket, the system will automatically switch to Normal mode. In vehicles with an automatic gearbox, the system automatically switches to gear position S when the Sport driving mode is selected. The system automatically switches to gear position E when the Eco driving mode is selected. The driver can adjust certain vehicle functions irrespective of the selected driving mode. For example, the driver can switch to gear position S when the Eco driving mode is selected. In some model versions the highest speed of the vehicle can only be achieved in the Normal or Sport driving modes. a) Comfort driving mode is available when vehicle is equipped with adaptive chassis control (DCC).